Size/width no longer in stock? Please select a color. Please select a width. Please select a size. Please select a color and width. Please select a color and size. Please select a width and size. Please select a color, size and width. Please select a variant. The classic Arizona is taken to stylish new heights with the addition of chunky lightweight EVA platform midsole. Shown in Birko-Flor®. Birko-Flor is made of easy-to-care-for and hygienic PVC, which has been lined on the inside with a soft, breathable layer of fleece. This high-quality material is very gentle on the skin, and it's comfortable while also being very durable. The flexible leather lining, which is gentle on the skin, nestles up softly against your foot and adjusts to its contour. The open-pored and thus very breathable surface makes for a comfortable foot climate, even during more strenuous physical activity. The heart of all models is the original BIRKENSTOCK footbed. The construction, which has been thought out to the smallest detail and makes it feel like you're standing in sand, helps your feet feel as comfortable as possible for hours on end. This supports health and promotes wellbeing. The very deep molding in the heel area supports the foot tissue and holds the heel bone firmly in its natural position. This provides the foot with nearly as much support when it is in a sandal as when it is in a closed shoe. Activates the calf muscles, stabilises the back of the foot and improves gait and coordination. 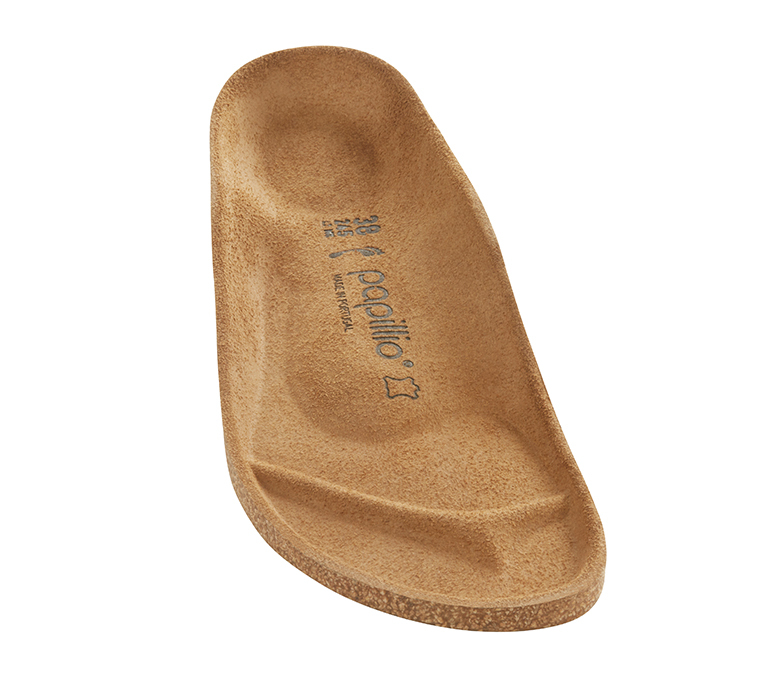 The arch supports that run alongside the sides of the footbed surround the tarsal bones inside and out. This gives the foot the stability it needs when it takes a step. The support that runs through the middle of the footbed stabilizes the metatarsal bone. In this way, the transverse arch support helps ensure that the foot has a naturally straight and solid stance. There are raised indentations at the front of the footbed near the toes. Thanks to the toe grip the toes remain loose and spread out in their natural position. The indentations also support the natural rolling motion of the toes. The footbed is drawn up especially high at the front. As a result, the high footbed edge protects the toes during the rolling motion of the foot.